American Icons. Holley and Mustang are two of the biggest names in performance and racing, and both have played a major role in automotive performance history. 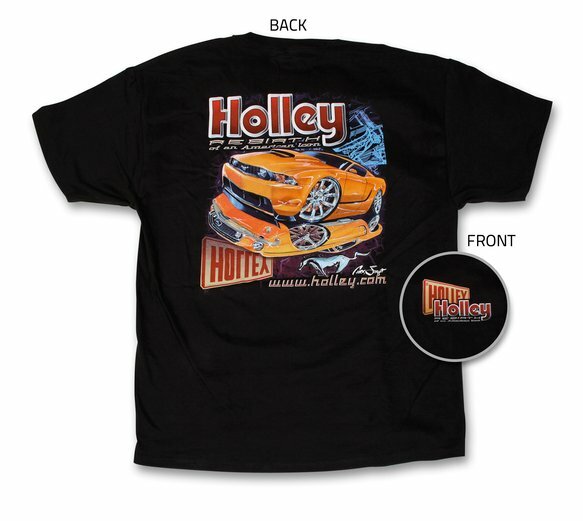 Celebrate the re-birth of the Mustang with this special edition T-Shirt from Holley. The back features Chris Froggett artwork showcasing the new Mustang with a 1967 Mustang cleverly mirrored in the pavement below on a black Hanes Beefy T-shirt. On the front, modern and vintage Holley logos show everyone that you're serious about automotive performance.